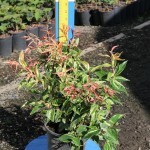 A slow growing shrub with gracefully arching branches. 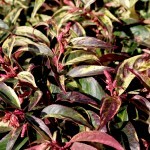 New leaves are bronze with pinkish mottling, turning dark glossy green with creamy variegation. It has fragrant white flowers. Prefers shade and moist soils, in part shade to part sun. Use in borders or for naturalizing. The species is native to the southeast of the U.S.